Seller Cylyons assumes all responsibility for the listing and deleting of this ad. 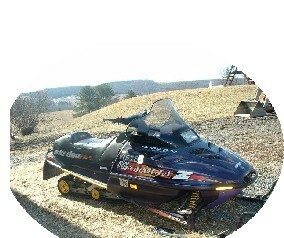 1998 670 POLARIS FORMULA Z SNOWMOBILE, WITH ONLY 2600 MILES ON IT.STUDDED TRACK. EXCELLENT CONDITION. KEPT INSIDE AND COVERED.MAINTENANCE WAS KEPT UP ON IT. ASKING $2,000.00. UNITYVILLE, PA. CALL EVENINGS: 570-458-4967. Cylyons: You may EDIT your ad Description, or Delete your ad.